This. Is. Awesome. 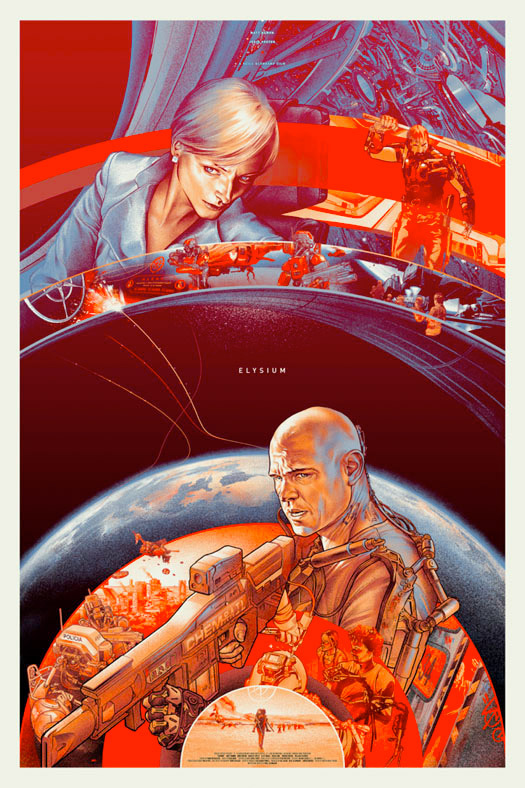 To wrap up their artwork debuts for Comic-Con 2013, Mondo News has debuted some amazing poster art designed by Martin Ansin for Elysium, the second sci-fi movie from writer/director Neill Blomkamp. The moment I heard Mondo was working on an Elysium poster, I knew I'd flip when I saw it, but I think this beats my expectations. I love this design and I cannot wait to get my hands on it. The art is evocative of so much sci-fi beauty, on top of highlighting the story and the two worlds they explore in Elysium. This just goes to show Mondo can still produce stellar posters that top anything from the studios. 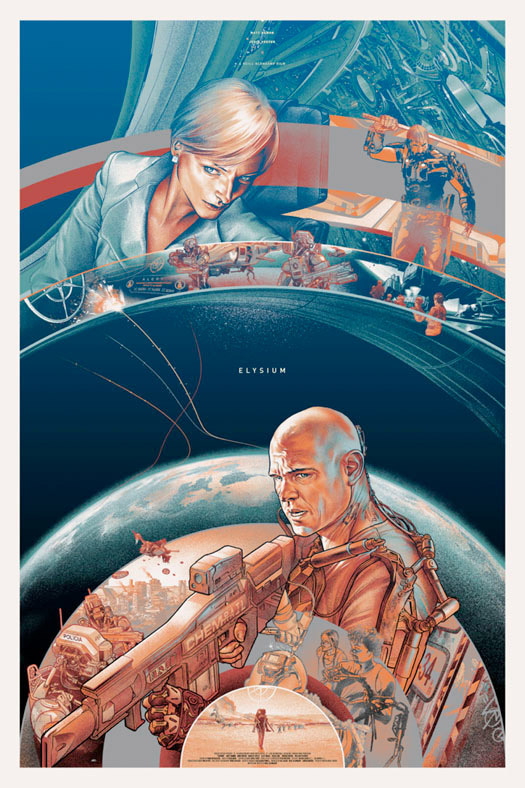 Here's the Martin Ansin Elysium art via Fandango, along with a blue variant, which be sold at Comic-Con. Elysium, directed by South African filmmaker Neill Blomkamp (of District 9), focuses on Secretary Rhodes (Foster), a hardened government ofﬁcial, who will stop at nothing to enforce anti-immigration laws and preserve the luxurious lifestyle of the citizens of Elysium. However, that doesn’t stop the people of Earth from trying to get in, by any means they can. When unlucky Max (Damon) is backed into a corner, he agrees to take on a daunting mission that if successful will not only save his life, but could bring equality to these polarized worlds. The screenplay was written by Neill Blomkamp. Read more about the film's composer Ryan Amon here. Sony/Columbia has Elysium set to hit theaters August 9th next month. See the trailer. Wow. Very creative. Seems to really put the story line into the artwork. Copley's katana is random and welcome. Combine the top of the blue version with the bottom of the red and I'm sold. Might be one of the best posters Ive ever seen. I want this so damn bad!!!!!!!!! !